The department of Zoology was established in the year 1948 and post graduate program was started in 1956. It is one of the oldest and prestigious departments of the college. Bird house was the main attraction of the department and Dr. J. N. Saxena was Prof. in charge of bird house. At that time three peacocks were gifted by Mr. M. P. Diwedi, Deputy Commissioner, Raipur. Department has state level unique Animal and Osteology museum. Initially the sanction posts were 13(1 professor &12 assistant professors) which were later cut down to 9 (1&8). Earlier there were 5 specializations (Ichthyology, Entomology, Cytology, Helminthology and Parasitology) in M.Sc. program. One year Diploma course in sericulture was run from 1988 to 1992. Then, in 1992 it was introduced as a subject in under graduate program. The department was also recognized as a research center by Pt. Ravi Shankar Shukla University, Raipur and Dr. Zubeda Khatoon was the first research scholar who was awarded her Ph. D. Degree under the supervision of Dr. S.M. Agrawal. About sixteen students completed their Ph.D in the department till date.Three minor research projects funded by UGC were completed. Time to time seminars /workshops was also organized by the department. The departmental library is rich in recent reference & text books, available for the post-graduate students. At present there are about 3214 books in the library. The life lines of the department are; well-equipped spacious UG laboratory, instrumentation room with important equipments, research laboratory, highly qualified and good teachers and dedicated supporting staffs. In order to enhance teaching learning process regular seminar, group discussion, and quiz are arranged by the faculty in the department. Our main moto is to achieve excellence in teaching and enhancement in learning..
Dr. Govt.RBS Girls College, Raipur. The vision of the department is to emerge as a premier department serving as a centre of excellence in knowledge, training and placement. The department emphasizes holistic development of the students and enable them to contribute effectively for welfare of themselves and society. MISSION: The department envisages to get established as an excellent center for higher education in the domain of animal science in the state of Chhattisgarh and nearby region. Provide affordable educational services, inspire to all the section of society to get expertise /skills at P.G. To bring awareness among students regarding nature and biodiversity and help to solve different problems. Effective teaching by skilled and dedicated teachers. All faculties are well qualified and committed. Command on curriculum and completion of syllabus within scheduled time. Teaching and examination schedules are planned in advance. The department has good animal museum and osteology setup which are the oldest and biggest in the state. Lack of spacious research lab for Ph.D students in the department. Less number of supporting staff (lab attendant and museum keeper). The college is in prime location. 3. Department has good library with very rare books and good reference books. 4. It has learned professors in the different field of animal science. Department is facing problems of inadequate class rooms, research, PG and UG labs. The majority of the student comes from very remote area. Department is planning to open a new elective papers - Immunology and Immuno-techniques in P.G. level which will be helpful in various competitive exams (Ph.D entrance, NET/SLET). Department is also planning to establish immunological lab with recent facilities. Preparation of faunal catalogue (insects, fishes, birds and others). 2. Damle, K.L., Gupta, S. and Sharma, M. (2016): Biodiversity of mites in poultry dust at Rajnandgaon district of Chhattisgarh, India. Research Journal of Animal, Veterinary and Fisheries Science, 4(5): 7-9. 3. Devendra Singh Porte and Seema Gupta (2017): Assessment of distribution pattern of wetland birds between unpolluted and polluted ponds at Ratanpur, district Bilaspur, Chhattisgarh, India. Indian Journal of Scientific Research, 12(2): 204-215. 2. National conference on “Prospects of Life Science for human welfare with special reference to Chhattisgarh” & first Chhattisgarh congress of ZSC, Department of Zoology, Govt. V.Y.T. P.G. College Durg.7th- 8th Feb, 2015. 3. National Conference on “Recent advances in medicinal plant research and its application in human health”. Department of Zoology, Bhilai Mahila Mahavidhyalaya, Bhilai 2-3 March2015. National symposium on role of quality control in healthcare management Department of Biochemistry, Pt. J.L.M. Medical College, Raipur. July 25th, 2015. National seminar on Enhancement strategies in quality education and research, IQAC, Govt. NPG College of Science, Raipur. November 27-28, 2015. Interdisciplinary international seminar on “Rationalizing the utilization of available natural resources through appropriate technological intervention”. Swami Shri Swaroopanand Saraswati Mahavidyalya, Hudco, Bhilai, September-22-24, 2015. 1. National Symposium on Genetic basis of haematological disorders with special emphasis on Sickle cell disease. Department of Biochemistry, Pt. J.L.M. Medical College, Raipur. July 25, 2017. 2. International conference on “Frontier in Pharmaceutical Sciences and Research” organized by Columbia Institute of Pharmacy, Raipur, C.G., India, 23 rd&24th September, 2017. Mishra, P. and Gupta, S. (2014): Comparative study of haematology of two catfishes exposed to leaf extract of Eclipta alba in “International colloquium on Endocrinology and Physiology”, 29-30 September, 2014, Department of Zoology, Govt. D.B. Girls PG College, Raipur. Mishra, P.and Gupta, S. (2015): Effect of Eclipta alba on biochemical parameters of Clarias batrachus in National Conference on “Recent advances in medicinal plant research and its application in human health”. Department of Zoology, Bhilai Mahila Mahavidhyalaya, Bhilai 2-3 March 2015. Mishra, P. and Gupta, S. (2015): Effect of Eclipta alba on nonspecific immune response of Clarias batrachus. National conference on “Prospects of Life Sciences for human welfare with special reference to Chhattisgarh and ist congress of ZSC, Department of zoology, Govt. V. Y.P.T. Autonomous College, Durg, February 7-8, 2015. Rusa sponsored workshop on “Quality Education ” Govt. Nagarjuna P.G. College of Science, Raipur on 22rd June, 2015- As a Convener. Rusa sponsored workshop on “Quality Education ” Govt. Nagarjuna P.G. College of Science, Raipur on 23rd June, 2015 - As a Convener. Rusa sponsored workshop on “Governance, Leadership &management” Govt. Nagarjuna P.G. College of Science, Raipur on 24th June, 2015 - As a Convener. Rusa sponsored workshop on “Examination reforms” Govt. Nagarjuna P.G. College of Science, Raipur on 25th June, 2015 - As a Convener. Rusa sponsored workshop on “Strategies development and deployment to achieve access equity and excellence in higher education system” Govt. Nagarjuna P.G. College of Science, Raipur on 26th June, 2015 - As a Convener. Rusa sponsored workshop on “Career Guidance” Govt. Nagarjuna P.G. College of Science, Raipur on 27th June, 2015 - As a Convener. 1. Capacity-building workshop on laboratory techniques & maintenance, Govt. N.P.G. College of Science, Raipur 18-20th November, 2015- As co-convener. 2. National seminar on Enhancement strategies in quality education and research, IQAC, Govt. NPG College of Science, Raipur. November 27-28, 2015-As a convener. Capacity-building workshop on laboratory techniques & maintenance, 18-20th November, 2015. 1. Delivered lecture on Fertilization- biological role of fertilization, basic requirement, activation of egg, metabolism biochemistry of fertilization on 1.2.2016 at department of Zoology, Govt. D.B. Girls P.G. College, Raipur. 2. Delivered lecture on molecular basis of fertilization on 15.2.2016 at department of Zoology, Govt. V.Y.T. PG College, Durg. Best poster award in National Conference on “Recent advances in medicinal plant research and its application in human health”. Department of Zoology, Bhilai Mahila Mahavidhyalaya, Bhilai 2-3 March 2015. Governing body of Disha College appointed by Pt. RSS University, Raipur 2014-2016. 6. As a subject expert in VYAPUM exams. 7. As a member of Board of Studies Ravi Shanker Shukla University, Raipur. 8. As expert member of Board of Studies, Govt. Chattisgarh College, Raipur Board of Studies. 9. As an expert member of Board of Studies in Zoology, Govt. V.Y.T. College, Durg. 10. As a subject expert in the interview of teacher under statue 28 organized by Ravi Shankar Shukla University, Raipur. 11-As an expert member of Board of Studies, Department of Zoology, Govt. Science College, Bilaspur. 1-As a subject expert of Institutional Ethical Committee for human and Animal research - D.B girls College, Raipur 2016-17. Gupta S., Maheshwari R. and Ramtake A. (2015). Assessment of Chronotype, Body Mass Index and its Relation with Peak Expiratory Flow Rate. International Journal of Pharmacology and Biological Sciences, Volume: 9, No. 1&2. ISSN 0973-6808. Maheshwari R (2015). Impact of Landfill Waste On Health: An Overview. IOSR Journal of Environmental Science, Toxicology and Food Technology (IOSR-JESTFT) e-ISSN: 2319-2402, p- ISSN: 2319-2399. Volume. 1 Issue. 4, PP 17-23, Sept. 2015 www.iosrjournals.org. Kavita Das, Renu Maheshwari and Indu Mandrik. (2017). Some behavioural observations of the Indian Robin, Saxicoloides Fulicata. Indian J.Sci.Res. 12 (2): 107-110, 2017 ISSN 0976-2876 (Print) ISSN: 2250-0138(Online). Symposium on “Digital Medicine”, Dept. of Biochemistry.Pt. J.N.M. College Raipur. 25th July, 2014.
International Colloquium on Endocrinology and Physiology. Dept. of Zoology, Govt. D.B.G.P.G. Autonomous College, Raipur, (C.G. ), 29 – 30 September, 2014. National Conference on Prospects of Life Sciences for Human Welfare with Special Reference to Chhattisgarh. Jointly organized by Zoological Society of Chhattisgarh and Dept. of Zoology, V.Y.T. P.G. Autonomous College, Durg 7-8 Feburary, 2015. National Symposium on “Role of Quality control in Health Care management” Pt. Deendayal Upadhyay Centre for Genetic Disease and Molecular Biology, Department of Biochemistry, Pt. J.N.M. Medical College, Raipur (C.G.). 25th July, 2015.Oral Presentation: “Quality control in Health Care management: Alternative roles”. Awarded by 03 Credit. National Seminar on “Conservation of Plant Biodiversity: Global Issues”. Dr. Radhabai Govt. Naveen Kanya College, Raipur, (C.G.). 7th August, 2015. Abs. Publ. : Human Impact on Conservation of Plant Diversity. Interdisciplinary International Seminar on “Rationalizing the utilization of available natural resources through appropriate technological intervention” Dept. of Zoology and Microbiology, Swami Shri Swaroopanand Saraswati Mahavidyalya, Hodco, Bhilai (C.G.). 22nd Sept. to 24th Sept. 2015. Oral Presentation. : “Impact of Landfill waste on health: An overview”. National Seminar on “Enhancement Strategies in Quality Education and Research” Internal Quality Assurance Cell (IQAC), Govt. N.P.G. College of Science, Raipur, (C.G.). 27th- 28th November, 2015.Also worked as Treasurer & Prepared a Questioner. National Conference on “Modern Life Sciences-Perspective and Prospects” Govt. College Bhakhara, Dist. Dhamtari, (C.G.). 04-05 December, 2015. Abs. Publ. & Paper Prest, as a Resource Person,: “An Overview on Waste Management As Necessitate For Control The Hazardous Diseases. Abst. Pub. : Insulin mimetic action of vanadate in alloxan induced diabetic Rabbits. In same Conf. 2. Interdisciplinary National Seminar on “Behavioral Impact of Animals and Micro-organisms on human life and their Environment” organized by Department of Zoology, Govt. Dr. W.W. Patankar Girls’ P.G. College, Durg (C.G.) on 3rd& 4th February, 2017. In this Seminar three abs. published, one invited talk and one Poster Presentation (best performance AWARD) Chaired the Session &Member of Advisory Committee. International Colloquium on – Ambient Science to Strengthen the Green Economy. Organized by National Cave Research and Protection Organization. Co-sponsored by C.G. Cost and India SERB. Oral Presentation: Impact of Environmental Pollution on Health Issues in response to Waste: An overview. 7th to 10 th June, 2018. Rusa Sponsored: organized by Govt. N.P.G. College of Science, Raipur. “Quality education” 23rd June, 2015. As Co-convener & Prepared a Questioner. “Governance, Leadership & Management”. 24th June, 2015. “Examination Reforms”. 25th June, 2015. “Strategies development and deployment to achieve access, equity and excellence in higher system”. 26th June, 2015. 5. “Carrier Guidance”. 27thJune, 2015. 2. State level workshop on “Enhancement in work efficiency of Office and Technical staff”. Organized by Swami Shri Swaroopanand Saraswati Maha viddyalya, Hudco, Bhilai from 21st to 23rd June 2016. In this workshop In this workshop (Invited talk) on, Topic- Basic Lab Techniques. 3. Capacity –Bulding Workshop on “Laboratory Techniques & Maintenance”. Organized by Govt. N.P.G. College of Science, Raipur. 18th-20th November, 2016. As a Resource Person. 2. Nikon School Workshop for BASIC D-SLR. Organized by Nikon India Pvt. Ltd. on 10.12.2016. 3. Nikon School Workshop for PHOTO WALK, Organized by Nikon India Pvt. Ltd. on 11.12.2016. 4. National workshop on “Alternatives of dissections and animal experimentation in Zoology”, Organized by Department of Zoology, Bhilai Mahila Mahavidhyalaya, Bhilai Nagar (C.G.) on 27th January to 02nd February. Abstract and (Invited talk) on, Is animal necessary for the Zoological studies? (30.01.2017) and also member of advisory committee. 5. Strategies and Challenges in Implementing Extension of Higher Education and Improvement in Quality of Higher Education. Organized by Govt. N.P.G. College of Science, Raipur. 20th June, 2017. Rusa Sponsored. 6. Road Map of Quality Enhancement. Organized by Govt. N.P.G. College of Science, Raipur. 21st June, 2017. Rusa Sponsored. 7. Examination Reform. Organized by Govt. N.P.G. College of Science, Raipur. 22nd June, 2017. Rusa Sponsored. 8. Strategies and Challenges in Implementing Semester System and Choice based Credit (CBCS) system. Organized by Govt. N.P.G. College of Science, Raipur. 23rd June, 2017. Rusa Sponsored. As a Co-convener. 9. Collection of Data, Analysis and Report Preparation. Organized by Govt. N.P.G. College of Science, Raipur. 2ndJune, 2017. Rusa Sponsored. 10. National workshop on “Capacity Building in Higher Education: Use of Library resources. Organized by Govt. N.P.G. College of Science, Raipur. 27thJune, 2017. Rusa Sponsored. National workshop on “Enzymology and its application (Isolation, Purification and Immbobalization of Enzymes-Amylase and Lipase”). 12-18 January, 2018. Also act as a Resource Person. “Enzymes and Human Health”. Evaluation of Sodium Arsenite (Na3AsO3) induced oxidative stress, genotoxicity and its recovery by Ocimum grastissimum L. in Oryctolagus cuniculus L.
Avifaunal diversity of Katghora, District Korba, Chhattisgarh: A Preliminary Study. Effect of vanadate on certain blood parameters of alloxan induced diabetic Rabbits. Effect of LL and DD on packed cell volume in an Indian Freshwater catfish Clarias batrachus. 3. “Health Threats due to Hazardous Wastes: A Review”. 4. “Dissection- The phenomenal device in higher learning and research in Zoological Sciences”. 5. “Checklist of Bird Species in Barnawapara Wildlife Sanctuary, District Mahasamund, C. G”. Poster presentation: (Awarded as a Ist Prize). 6. “Robin: The most familiar garden bird”. Poster presentation: (Awarded as a IIIrd Prize). Behavioral impact of some aquatic invertebrates causing occupational health risks. Why waste management is mandatory: An overview. 2. Dissection may or may not be in teaching – learning methodology. Invited talk. 3. Checklist of birds in Udanti wildlife sanctuary, District Gariaband, Chhattisgarh. 4. Local Avain fauna with and without sexual diamorphism. invited talk. 3. “Identification of fish” Department of Zoology, Govt. D.B. Girls P.G. College, Raipur, (C.G. ), 08 April 2015. .“Awareness in Healthcare Management” Lecture series, Orientation Workshop for school students at Chhattisgarh Science Center, Dalal Seoni, Saddu, Raipur. 27th October, 2015. “Personality Development: How endocrine system regulates by YOGA” Gurukul Mahila Mahavidyalaya, Raipur, 01st December 2015. 2. Healthcare Management: Prevention from Communicable Diseases. In Guest Lecture Series about ‘Health & Disease Awareness’, Organized by Department of Zoology, Govt. De. W.W. Patankar Girls’ P.G. College, Durg (C.G.). 18.10.2016. 3. Why Cleanliness is Mandatory? In Govt. College, Baloda Bazar. 08.11.2016. 4. Causes and Prevention of Hazardous Diseases: Some Alternatives. In Gurukul Mahila Mahavidhyalya, Raipur (C.G.). 23.11.2016. Course Coordinator: (20 August to 09 September, 2015: 3 Weeks: for the Refresher Course in Zoology organized by Dept. of Human Resource Development Centre, Pt. R.S. University Raipur. Member of Examination Committee: Pt. Ravishankar Shukla University, Raipur. Harishankar College Kachana, Raipur for B.Sc. Aadarsh Mahavidhyalya, Datrenga, Raipur for B.Sc. Govt. Nehru P.G. College, Dongargadh for M.Sc. Govt. B.P. Arts, Commerce & Science College, Arang, for M.Sc. Govt. Veer Surendra Sai College, Gariaband, for M.Sc. Govt. Pt. Shyamacharan Mishra College, Devbhog. For M.Sc. Govt. College, Bhakhara. For M.Sc. 1. Life member for “Indian Society for Comparative Endocrinology”. 2. International Conference on “Frontier in Pharmaceutical Sciences and Research with the theme “Advances in development delivery system and clinical monitoring of drugs helon 23rd& 24th September 2017 organized by Columbia Institute of Pharmacy, Raipur, CG, India. 3. National conference of Zoological society of Chhattisgarh on "Prospects of Innovation in Life Sciences and Socio-Economic Challenges” organized by Deptt. Of Zoology, C. M. D. P.G. College, Bilaspur in collaboration of Bilaspur Vishwavidyalaya 2-3 December 2017. 4. National seminar on “Recent trend in library services” held at Govt. N.P. G. College of Science, Raipur on 01 June 2018. 1. Preeti Mishra and Seema Gupta (2014): Comparative study of haematology of two catfishes exposed to leaf extract of Ecliptaalba International colloquium on endocrinology and Physiology. Dept. of Zoology, Govt. D. B. Girls College, Raipur. • As resource person in orientation programme on 8.12.16, organized by Chhattisgarh Science centre, Raipur. 1. National symposium on “Digital Medicine” 25.7.2014, Pt. J.N.M.Medical college Raipur. National symposium on Quality management in laboratory investigations and Haematological disordes. 25th July 2017, disease 25- 26 july 2016. Pt DDU Center for genetics diseases and molecular biology, Deptt. Of Biochemistry, Pt. J.N.M. medical college, Raipur, C.G. National seminar-2018, Recent trend in Library sciences.Pt. Sunderlal Sharma library and SOS in library and Info science 1 June2018-, Pt R.S.U., Raipur(C.G.) and Govt. N.PG. college of science. 1. .Workshop on “Quality Education”, 23-06-15, Govt. Nagarjuna P.G. College of Science, Raipur. 2.Workshop on “Strategies and challenges in implementing extention of higher education and improvement in quality of higher education.” ; 20th June, 2017, Govt N. P. G College of Science. 4.Workshop on “Strategies and challenges in implementing semester system and choice based credit system.”; 23rd June, 2017, Govt N. P. G College of Science. 5. Workshop on “Collection of data, analysis and report preparation”; 24th June, 2017, Govt. N. P. G. College of Science. 2. Life member for “Zoological Society of Chhattisgarh”. Award received by Prof. A.K. Pandey on 22.12.14 at Delhi. 3. For outstanding achievements in the field of education. Impact of landfill waste on health: An overview Maheshwari R., Gupta S., Das K.. IQSR Journal of Environmental Sciences. Toxicology and food technology ( IQSR. JESTFT) e-Issn: 2319-2402p-ISSN 2319-2399 pp-08-14 www.iossjournals. Sep 2015. Symposium on Digital medicines, Pt DDU Center for genetics diseases and molecular biology, Deptt. Of Biochemistry, Pt. J.N.M. medical college, Raipur, C.G. International colloquium on endocrinology and physiology 29-30 September 2014, Department of zoology Govt. D.B. girls P.G. Aautonomous College , Raipur. National conference on prospects of life science for human welfare with special reference to Chhattisgarh & first Chhattisgarh Congress pf ZSC. 7-8 Feb 2015 Dept of Zoology Govt. V.Y.T.P.G Autonomous College, Durg. National symposium on Role of quality control in health management 25July 2015.Pt. D.D.U. Center for Genetic diseases and molecular biology, Deptt. of Biochemistry, Pt. J.N.M. Medical college, Raipur, C.G. National conference on prospects in life science, paradigm shift in teaching and research in zoological sciences under ZSC 2-3 March 2016 by Deptt. Of Zoology Govt.N.P.G.College of Science, Raipur. National symposium on Genetic basis of haematological disorders with special emphasis on sickle cell disease 25- 26 July 2016. Pt. D.D.U. Center for genetics diseases and molecular biology, Deptt. Of Biochemistry, Pt. J.N.M. Medical college, Raipur, C.G. National conference on “Tribal health and their nutritional status in Chhattisgarh New vistas”. 20-21 January 2017. By Deptt. Of Zoology Govt. N.C.J. Arts Science and Commerce college Dali Rajhara, Dist. Balod C.G. 3 National seminar,on “ Recent trend in Library sciences”. Pt. Sunder lal Sharma library and SOS in Library and Info science, Pt R.S.U., Raipur (C.G.) and Govt. N.PG. college of Science June2018-. “Quality education” 23rd June, 2015. Governance, Leadership & Management”.24th June, 2015. 1. Bird watching workshop, held on urja park, Raipur, 6.11 2016, Organized by bird count India. 2. Nikon school workshop for basic D-SLR on 10-12 2016. 3. Nikon school workshop for Photowalk 11.12. 2016. 4. National workshop on Alternative of dissections and animall experimentation in Zoology. Sponsored by UGC, CRO, Bhopal By, Bhilai mahila Mahavidyalaya, Bhilainagar. Abstract (Is animal necessary for Zoology dissection) 27January 2017 to 2nd February 2017. 2Abstrcts in National conference on prospects in life science, paradigm shift in teaching and research in zoological sciences under ZSC 2-3 march 2016 by Deptt. Of Zoology Govt .NPG college of science, Raipur. An overview: Some tribal culture and ethnicity of living in harmony with the Mother Nature. National conference on Tribal health and their nutritional status in Chhattisgarh New vistas. 20-21 January 2017. By Deptt. Of ZoologyGovt. N.C.J. Arts Science and commerce college, Dali-Rajhara, Dist. BalodC.G. Short invited lecture -Socio ecological behavioral pattern of different birds. National conference on prospects in life science , paradigm shift in teaching and research in zoological sciences under ZSC 2-3 march 2016 by Deptt. Of Zoology Govt .NPG college of science, Raipur. Poster. Awarded best performance in poster presentation. Poster presentation- Quality control vs Quality assurance. National symposium on Quality management in laboratory investigations and Haematological disordes. 25th- 26th July 2017, . Pt DDU Center for genetics diseases and molecular biology, Deptt. Of Biochemistry, Pt. J.N.M. medical college, Raipur, C.G. Co-convener of seminar,Chairperson in National conference on prospects in life science, paradigm shift in teaching and research in zoological sciences under ZSC 2-3 march 2016 by Deptt. Of Zoology Govt .NPG college of science, Raipur. 2. Life member for “Indian Society for Comparative Endocrinology”. 4. Life membership of Indian Chrono-biological Society. Shashi Gupta: Impact of Landfill Waste on Health: An Overview. IOSR Journal of Environmental Science, Toxicology and Food Technology (IOSR-JESTFT) e-ISSN: 2319-2402,p- ISSN: 2319-2399. Volume. 1 Issue. 4, PP 17-23, Sept. 2015 www.iosrjournals.org. 1. International Colloquium on Endocrinology and Physiology. Dept. of Zoology, Govt. D.B.G.P.G. Autonomous College, Raipur, (C.G. ), 29 – 30 September, 2014. 2. National Conference on Prospects of Life Sciences for Human Welfare with Special Reference to Chhattisgarh. Jointly organized by Zoological Society of Chhattisgarh and Dept. of Zoology, V.Y.T. P.G. Autonomous College, Durg 7-8 Feburary, 2015. 1. National Symposium on “Quality Control in health care management: Alternative roles” Organized by Pt. JNM Medical College, Raipur. Date 25 July, 2015. 5. National conference of “Prospects in Life Sciences : Paradigm Shift in Teaching and Research in Zoological Sciences”. Organized by Department of Zoology, Govt. Nagarjuna P.G. College of Science, Raipur (Chhattisgarh) 02-03 March 2016. June 2018- National seminar-2018, Recent trend in Library sciences.Pt. Sunderlal Sharma library and SOS in library and Info science, Pt R.S.U., Raipur (C.G.) and Govt. N.PG. college of science. International Colloquium on – Ambient Science to Strengthen the Green Economy. Organized by National Cave Research and Protection Organization. Co-sponsored by C.G. Cost and India SERB. Oral Presentation: Environmental Pollution Issues. 7th to 10th June, 2018. Effect of vanadate on certain blood parameters of alloxan induced diabetic Rabbits. National Conference on Prospects of Life Sciences for Human Welfare with Special Reference to Chhattisgarh. Jointly organized by Zoological Society of Chhattisgarh and Dept. of Zoology, V.Y.T. P.G. Autonomous College, Durg 7-8 Feburary, 2015. Workshop on Quality Education Organized by Govt. Nagarjuna P.G. College of Science, Raipur (C.G.) : 23rd June 2015. Workshop on Governance, Leadership & Management Organized by Govt. Nagarjuna P.G. College of Science, Raipur (C.G.) : 24th June 2015. Workshop on Examination Reform Organized by Govt. Nagarjuna P.G. College of Science, Raipur (C.G.) : 25th June 2015. Workshop on Strategies development and deployment to achieve access, equity and excellence in higher system. Organized by Govt. Nagarjuna P.G. College of Science, Raipur (C.G.) : 26th June 2015. Workshop on Career Guidance organized Govt. Nagarjuna P.G. College of Science, Raipur (C.G. ): 27th June 2015. State level workshop on “Enhancement in work efficiency of Office and Technical staff”. Organized by Swami Shri Swaroopanand Saraswati Mahaviddyalya, Hudco, Bhilai from 21st to 23rd June 2016. Capacity –Bulding Workshop on “Laboratory Techniques &Maintenahnce”. Organized by Govt. N.P.G. College of Science, Raipur. 18th-20th November, 2016. 2. National workshop on “Alternatives of dissections and animal experimentation in Zoology”, Organized by Department of Zoology, Bhilai Mahila Mahavidhyalaya, Bhilai Nagar (C.G.) on 27th January to 02nd February. Abstract on, Is animal necessary for the Zoological studies? (30.01.2017). 3. Strategies and Challenges in Implementing Extension of Higher Education and Improvement in Quality of Higher Education. Organized by Govt. N.P.G. College of Science, Raipur. 20th June, 2017. Rusa Sponsored. 4. Road Map of Quality Enhancement. Organized by Govt. N.P.G. College of Science, Raipur. 21st June, 2017. Rusa Sponsored. 5. Examination Reform. Organized by Govt. N.P.G. College of Science, Raipur. 22nd June, 2017. Rusa Sponsored. 6. Strategies and Challenges in Implementing Semeter System and Choice based Credit (CBCS) system. Organized by Govt. N.P.G. College of Science, Raipur. 23rd June, 2017. Rusa Sponsored. As a Co-convener. 7. Collection of Data, Analysis and Report Preparation. Organized by Govt. N.P.G. College of Science, Raipur. 2th June, 2017. Rusa Sponsored. 8. National workshop on 27th June 2017 “Capacity Building in Higher Education: Use of Library resources. Organized by Govt. N.P.G. College of Science, Raipur. ------ June, 2017. Rusa Sponsored. National workshop on “Plagiarism and IPR: A Prime concern for Academia”. Jointly Organized by Pt. Sunderlal Sharma Library, SoS in Library & Info. Science, Pt. Ravishankar Shukla University, Raipur (C.G.) & Govt. Nagarjuna Post graduate college, Raipur (C.G.) 02-03 June, 2018. Abs. Publ. : Human Impact on Conservation of Plant Diversity.Oral Presentation. :National Seminar on “Conservation of Plant Biodiversity: Global Issues”. Dr. Radhabai Govt. Naveen Kanya College, Raipur, (C.G.). 7th August, 2015. National Conference on “Modern Life Sciences-Perspective and Prospects” Govt. College Bhakhara, Dist. Dhamtari, (C.G.). 04-05 December, 2015. Paper Presented Insulin mimetic action of vanadate in alloxan induced diabetic Rabbits. National Conference on “Prospects in Life Sciences: Paradigm Shift in Teaching and Research in Zoological Sciences”. Dept. of Zoology, Govt. N.P.G. College of Science, Raipur, (C.G.). March 02 - 03, 2016. 3.“Waste management strategies relevant to health and disease”. “Health Threats due to Hazardous Wastes: A Review”. Abstract published in Souvenir of National Conference on “Tribal Health and Their Nutritional Status in Chhattisgarh- New Vistas. Organized by Department of Zoology, Govt. N.C.J. Arts, Science and Commerce College, Dalli Rajhara, District Balod. 20th – 21st January 2017. Title: An overview: Some tribal Culture and ethnicity of Living in Harmony with the Mother Nature. Is animal necessary for the Zoological studies? in National workshop on “Alternatives of dissections and animal experimentation in Zoology”, Organized by Department of Zoology, Bhilai Mahila Mahavidhyalaya, Bhilai Nagar (C.G.) on 27th January to 02nd February. (30.01.2017). An overview: Some tribal Culture and ethnicity of Living in Harmony with the Mother Nature. National Conference on “Tribal Health and Their Nutritional Status in Chhattisgarh- New Vistas. Organized by Department of Zoology, Govt. N.C.J. Arts, Science and Commerce College, Dalli Rajhara, District Balod. 20th – 21st January 2017.
International Colloquium on – Ambient Science to Strengthen the Green Economy. Organized by National Cave Research and Protection Organization. Co-sponsored by C.G. Cost and India SERB. Oral Presentation: Environmental Pollution Issues. 7th to 1oth June, 2018. 1. Assistance of chronotype body mass index and its relation with peak expiratory flow rate,. National Conference on “ Prospects of life science for human welfare with special reference to Chhattisgarh”. Organized by: Department Zoology, Govt. VYTPG Autonomous College, Durg (C.G.) Date: 07-08 February 2015. 2.Effect of eating Disorder on Aldoscents psychological and physical fitness. National Seminar on The Problems of Eating Disorder & its effect on Health & Fitness organized by Govt. Minimata Girls College Baloda Bazar-Bhatapara. Date 20-21 February 2015. 3. efgyk l’kfDrdj.k % xzke iapk;r d¢ lanÒZ esa , National Seminar on The Problems of Rural Development organized by Govt. Minimata Girls College Baloda Bazar-Bhatapara. Date 20-21 February 2015. Paper Presentation “Quality Control in health care management: Alternative roles” National Symposium on Role of Quality Control in Healthcare Management”. Organized by Pt. JNM Medical College, Raipur. Date 25 July, 2015. 4.Paper Presentation “Psychological Disorders : Effect of Youga” National Seminar on Yoga – Society and Health. Organized by Minimata Girls College Baloda Bazar-Bhatapara. Date 22-23 September, 2015. 5. Paper Presentation in National Seminar on Trend of voting behavior in Indian Democratic System. Organized by Minimata Girls College Baloda Bazar-Bhatapara. Date 20-21 September, 2015. 7. Paper Presented in National conference of “Prospects in Life Sciences: Paradigm Shift in Teaching and Research in Zoological Sciences”. Organized by Department of Zoology, Govt. Nagarjuna P.G. College of Science, Raipur (Chhattisgarh) 02-03 March 2016. 1. Techniques of Sericulture: On In Gurukul Mahila Mahavidhyalya, Raipur (C.G.). 23.11.2016. The department develops more research facility in the area of fish physiology, animal diversity, animal behavior and vermi-composting. The work of Dr. Seema Gupta & Dr. Renu Maheshwari for Ph. D. program was based on air gulping behavior of catfishes. Dr. Preeti Mishra worked on the effect of medicinal plant on hematology, biochemistry and immunology of catfishes. Dr. Kavita Das worked on neuro-endocrine system and the neuro-endocrine control of vitellogenesis in the tasar worm. Dr Shashi Gupta worked on toxicology. Dr. Pallavi Sinha’s work was based on bio-hydrogen production. Two elective papers were introduced in M.Sc. IVth Semester i.e. paper 1- Biology of immune system and paper 2-Immuno Pathology & immuno techniques. Both papers are important for students preparing for CSIR-JRF (NET) examination. Context: Field tour serves as an opportunity for exploration, discovery and original experience of animal life. Aim: To gain the practical knowledge of the aquaculture and vermiculture in the field and aware the villagers to a number of social evils by the students. Activity: M.Sc. students along with faculty members Dr. Seema Gupta and Smt. Indu Mandrik visited a fish farm at, Tirga, Dist. 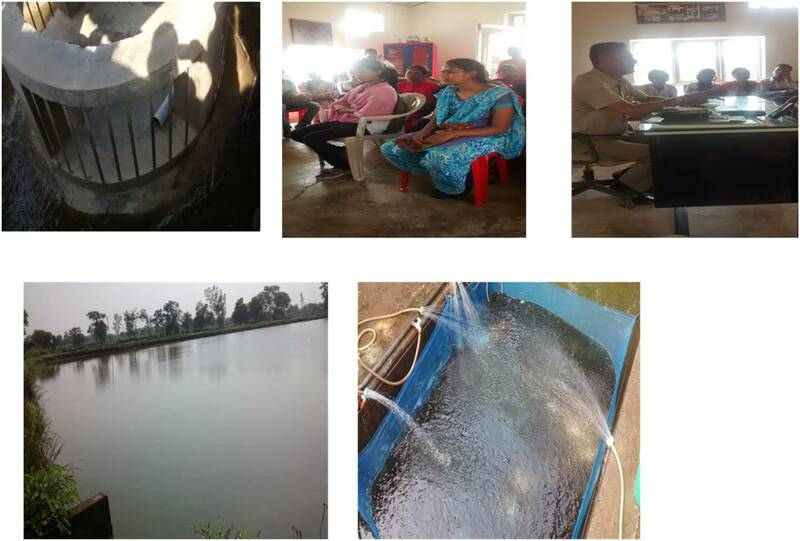 Durg on 17/10/2014 to study induced breeding, fish pond & its maintenance, identification of male & female fish and integrated farming, prawn culture and Vermiculture. They performed Nukkad Natak against “Andh-vishwas” and also delivered lectures on different social issues like Nasha Mukti, Dahej Pratadana, Human Rights amongst the students of Govt. H.S. School of Tirga Village. Students participated in plantation with local school students. Learning outcome -They learned about fresh water fish culture, Vermiculture, prawn culture and learn how to aware the villagers to various social evils. Context: Study tours are important in many ways. It provides valuable educational opportunities away from the classroom, without using textbooks and other tools used in a normal course. Students will have a greater knowledge of how presently wildlife conservation and management relates to the economy and environment as well as in future. Activity: M.Sc. students visited a Wildlife Sanctuary, Barnavapara, Dist. Mahasamund with teaching faculty Dr. Seema Gupta, Dr. Renu Maheshwari and Dr. Kavita Das and non-teaching staff on 05.04.2016. This sanctuary was established in 1976 under Wildlife Protection Act of 1972. The area of sanctuary is 245 sq km and is well known for its fauna and flora. This sanctuary is mainly comprised of Bamboo, Sal, Terminalia, Teak and many other varieties of trees. The rich flora supports a wide variety of wildlife. During the visit students got opportunity to interact with Ranger of Barnawapara Mr. Manoj Chandrakar and discussed about rules and regulation of forest. He explained how to identify the animals and how one shouldbehave in the Jungle. In addition he also discussed about wildlife conservation. During the visit we got opportunity to see Monkey, Bison, Neelgay (Male & Female), Deer, Bear and variety of birds like Peacock, Red vented Bulbul, Crow, Dove, Neelkanth, Sparrow etc. Learning outcome: Students learned to identify species, characteristics, habitat requirements and behaviour of animals. Students also gained knowledge to solve problems related to wildlife conservation and management. National Conference on “Prospects in Life Sciences: Paradigm Shift in Teaching and Research in Zoological Sciences” sponsored by UGC and CG COST, was organized by the Dept. of Zoology, on March 02 - 03, 2016. Context: Skills are essential both to reduce poverty and to improve personal well-being. Empowering Youth through Life Skills” (25/03/2015): Dr. Amba Sethi (Psychiatrist, Ekam) discussed that present generation of children and youth are more emotionally troubled than the earlier generations. This is evident by significant increase in youth suicides and also pschycological problems. The need of the hour is to make the youth emotionally intelligent and raise their self-esteem. They need to be taught to be more resilient and to cope with stress. We need to equip our children to face the struggle of life and to teach them life skills like problem solving and decision making. Context: Yoga is an invaluable gift of India's ancient tradition. Practicing yoga helps in controlling an individual's mind, body and soul. It brings together physical and mental disciplines to achieve a peaceful body and mind; it helps to manage stress. 2. Aim: Yoga is so effective for stress relief because, it encourages a good mood, an increase in mindfulness, and a healthy dose of self-compassion. Dr Vivek Bhartiya, (BNYS, M.A. (Yoga), Dip Aerobics) Zumba Instructor given a lecture on Stress removal and Personality Development by Yoga. Stress is simply a reaction to a stimulus that disturbs our physical or mental equilibrium. In other words, it's an omnipresent part of life. A stressful event can trigger the “fight-or-flight” response, causing hormone such as adrenaline and cortisol to surge through the body. A little bit of anxiety can be exciting—it keeps us active and alert. But long-term, or “chronic stress,” can have detrimental effects on health. You may not be able to control the stressors in your world, but you can alter your reaction to them. Human body deals stress in 5 ways – Rationalization, Escape, Compensation, Diffusion & Repression. In his talk he explained how things influence our stress tolerance level. Learning outcome: Yoga regulates stress hormone and improves quality of life. Yoga is as a potential tool for the youth to deal with stress and to regulate themselves. Beneficiary: M.Sc. Students and teaching staff. 1. A lecture of Prof. Reeta Soni (Deptt of English) on “Personality development” was organized on 6.2.18 for M.Sc. students. Lecture of Dr Reeta Soni (Asstt. Professor, Deptt of English)on “Personality Development” was organized on 6.2.18. Context: Personality development is the relatively enduring pattern of thoughts, feelings, and behaviors that distinguish individuals from one another. The dominant view in the field of personality psychology today holds that personality emerges early and continues to change in meaningful ways throughout the lifespan. Adult personality traits are believed to have a basis in infant temperament, meaning that individual differences in disposition and behavior appear early in life, possibly even before language or conscious self-representation develop. 1. What personality refers to the whole person not just a part? 7. Things to be avoided in yoga. Finally it was concluded that How to behave? Outcome: Benefits of Personality development is the over-all shine that is brought about in a person’s personality after undergoing personality development. The over-all demeanor of a person is more vibrant, it develops elements of many traits, that form a charming whole and there is a sharpening of personality for the better. The confidence and moral automatically gets a boost and a push with good personality development. The person gets a wonderful edge and a razor-sharp yet approachable as well as a warm outlook to life and people.